You can still find it on-line but it is now owned by the White Rain company and it doesn�t seem to come in the color pink we all knew and loved. 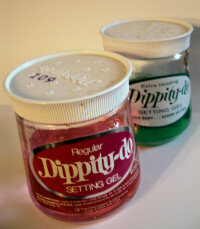 Here�s a link to see how Dippity-do looks now. Fancy a jar of the original formula? They are very difficult to find but, once located, can be had for well under $10. And talk about long lasting hold! Both 40 year-old jars that I have found have retained their consistency and unforgettable aroma.